I can’t believe my last long run of training is already here — and it looks like it’ll be a perfect day for it! I’ve been pretty lucky with the weather for almost all my runs during this round of training; it certainly makes for a more pleasant running experience when you’re not out in the cold and rain for hours. Even though the heat can get to you sometimes during summer marathon training, I’d take that any day over winter marathon training. Fall races FTW! Falling running sure beats winter running! I’ve got 34 km to run today (once I finish this blog and, more importantly, my coffee), then the Beat The Blerch half marathon next week, followed by a 15 km run, a 10 km run then race day. In three weeks I’ll be running 28 km of rock and root-covered trails with 4,000 feet of vertical for the Finlayson Arm 50. But I’ve barely been out of the trails lately, let alone done much running. My last long trail run was about a month ago when I did 23 km. Then I took a week of vacation. Then got sick. Then helped Matt move. I did manage to go for a 2.5 hour hike this Sunday… but now I’m sick again. Ugh. Just running like a girl. You know when you’re on a treadmill at the gym and someone chooses to take the one right next to you, even though there are plenty other treadmills available? And then you assume, naturally, that they want to race and you set your speed just a little bit higher than theirs? Must be a runner thing, then. 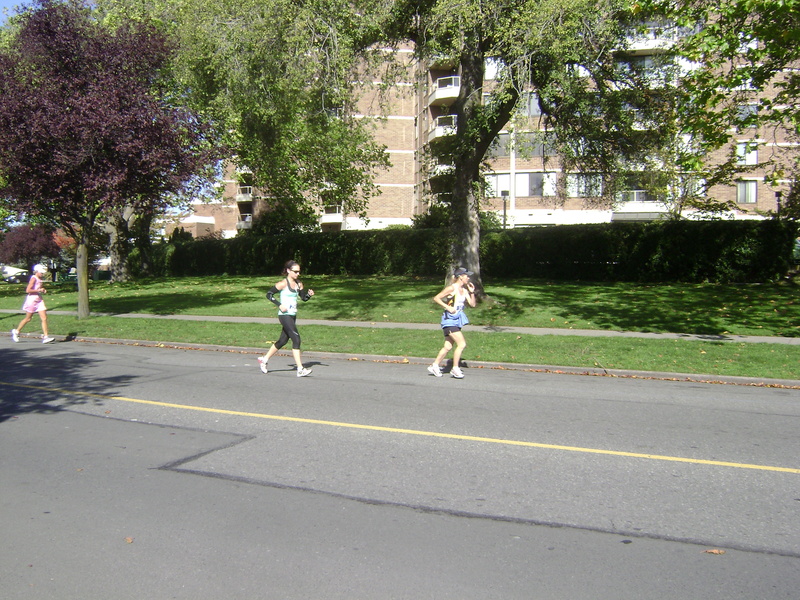 Anyway, I find that if someone passes you outside during a training run, you feel less compelled to hold your own. Maybe you pick up the pace for a minute, then realize they’re just going at a pace that’s comfortable for them and you should probably stick to what pace you planned to do that day. Celebrating our fastest half marathon times! As runners, we all know we should be doing it. It should be as much a part of our training as speed drills and the long, slow run. No, I’m not talking about stretching (even though we should do that, too). I’m talking about strength training. A few weeks ago, Lululemon reposted this article on their blog from Jason Fitzgerald, a running coach at StrengthRunning.com, which promotes the benefits of strength training for runners. While Fitzgerald does a pretty good job of explaining why runners should incorporate strength training into their training plans and what they should be doing, he doesn’t really explain how. Somehow, I managed to run a 3:41 at the 2013 Goodlife Fitness Victoria Marathon. That’s almost a 25-minute improvement over my previous marathon time of 4:07 something from two years ago. Yeah, I’m as surprised as you are about that… especially considering that I only just decided to sign up for this race a few days before the event date. Apparently not training properly works well for me? …and I haven’t trained for it. Apparently I haven’t learned my lesson from my torturous adventure at the Squamish 50 and I don’t take my own advice about training for endurance events. But I love to run. And I love this race. So I’m doing it. My 2013 non-New Year’s resolution post! Well… I didn’t really meet the 2012 goals I set out in last year’s non-New Year’s resolution post, partly due to work/life factors, and partly because I didn’t follow my own advice of setting small, weekly goals for yourself as you work towards your larger goals. 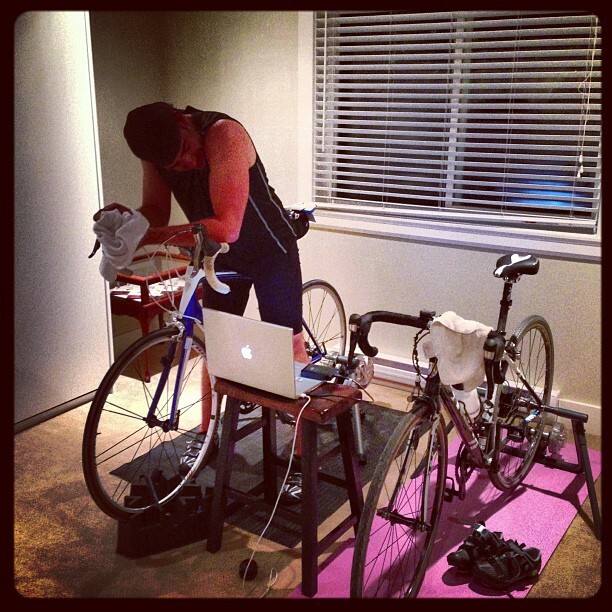 Something I’ll never be able to do at my new place… my bike trainer sounds like a plane taking off. Remember when I quit the gym? Well… I’m on the hunt for a new place to workout indoors, but not because I’m tired of running outside. Who could ever get tired of that? I’d take running in wet, dreary west coast weather over a treadmill any day. No, it’s because my new downstairs neighbours can’t handle the sound of us walking across our living room floor, let alone me jumping around doing workout DVDs.